Having now got a copy of the three and a half hour long ‘Ultimate Cut’ of the film, I know that my original copy of the DVD, an hour shorter in length, is now redundant. 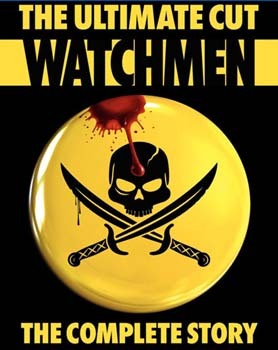 The whole problem with making ‘Watchmen’ into a film was how do you cram so much into so little time, so it stands to reason that the longer it is, the more detail you get. I totally understand why Alan Moore, the author, has been against film versions of his work, because they can never tell the story in a complete sense, only the book can do that. This was the dilemma the movie’s director Zack Snyder faced, and one he could never fully solve, but I applaud his efforts in getting as close as you could have expected anyone to via the, in this case, limited medium of film. The fact that he made an ‘Ultimate Cut’, including the ‘Tales Of The Black Freighter’ animation he’d commissioned (woven back into the story here, rather than being a separate entity), highlights his reverence for the subject matter, and the herculean task he’d set himself in translating it for the big screen. The ‘Ultimate Cut’ is only available as a US Import (Region 1 compatible), but I picked mine up for not much more than a tenner. Even with the postage costs it’s a real bargain given that it’s a five disc boxed-set with a whole heap of special features (very yummy when you become a total Watchmen geek), including ‘The Complete Motion Comic ‘, which presents the story panel by panel, using the original artwork. The running time for this is five hours twenty-five minutes, which illustrates the impossibility of fitting everything into three and a half hours, let alone two and a half. Despite its inevitable flaws, I really rate the film, but I obviously recommend the book first and foremost. However, when you watch the film, providing your attention span can handle it, this is the version to see. Which makes us wonder why they didn’t make a 12-episode series instead.